Transparency Market Research (TMR) in one of its recent market study reveals the global distributed generation market to be intensely competitive. The presence of several top-notch players with immense technological expertise marks for a high degree of competition amongst these players. With further advancement of technological expertise to concur with renewable energy development initiatives, competition among these players is likely to escalate, says the report. Meanwhile, surge in utilization of alternative materials for the development of renewable energy is serving to provide growth opportunities for players in the distributed generation market. For instance, increasing use of carbon fibers in the manufacture of blades for wind turbines is leading key players to expand their service offerings to stay competitive in this market. 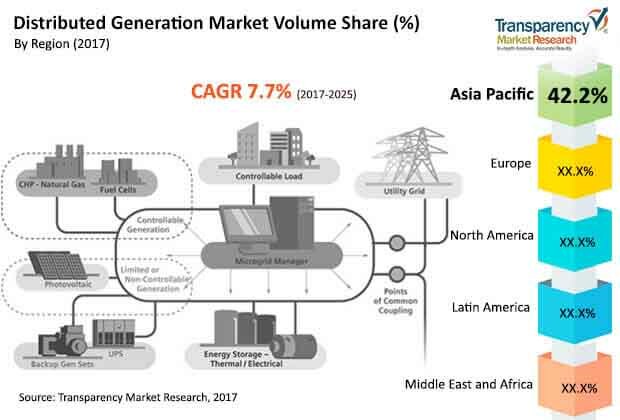 According to the TMR report, the global distributed generation market is predicted to rise at a CAGR of 8.2% between 2017 and 2025, for the market to be valued at US$35.56 bn by 2025. The market stood at a valuation of US$15.03 bn in 2016. In terms of technology, the combined heat and power (CH) segment is likely to hold key share of the distributed generation market over the forecast period. The key share of CH segment is ascribed to the flexibility of this technology that enables widespread deployment. Region-wise, Asia Pacific is likely to display promising growth due to rising energy needs of residential and industrial users. To serve this, efforts to expand installed capacity of current grids, and increasing focus on distributing power to off-grid locations are boosting the Asia Pacific distributed generation market. Among several factors driving the distributed generation market, thrust on clean energy is a prominent one. Worldwide, government agencies and energy conservation bodies are striving to tap renewable sources for energy needs. To attain such goals, distributed generation systems are increasingly gaining traction. This is because distributed generation systems when linked to an electric utility’s lower voltage distribution network aids distribution of clean energy. The setup serves to provide disruption free energy to consumers other than the ones subscribed to the utility company. Distributed generation systems also help reduce energy loss during transmission and distribution. In particular, in developed countries, distributed generation systems have shown to perform exceptionally well functionally. Distributed generation systems satisfy stringent laws and strict monitoring of energy networks to minimize wastage. Spiraling utilization of photo voltaic panels for domestic energy needs is currently a key trend in the renewable energy space. For domestic energy needs, distributed generation setup works to tap solar energy and employ a host of technologies to convert into usable energy. Lastly, distributed generation frameworks provide advantage of lower operational cost and diminished per unit cost of production. Such frameworks are likely to be sustainable to meet the spiraling energy needs. For example, according to the Electronics Industries Alliance Association, the world energy utilization is likely to ascend 28% between 2015 and 2040.